Provides fire alarm cover to the deaf and hard of hearing. Compatible with all silent alert monitors and pagers and is simple to fit and inexpensive to maintain. Provides a range of up to 1000m in open air. For the deaf and hard of hearing, tasks that most people take for granted can be difficult. For example, conventional fire alarms are loud enough for the average person but can go unnoticed by the deaf, leading to possibly catastrophic results. 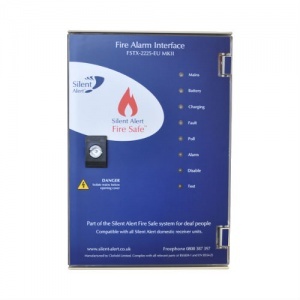 The Silent Alert Fire Safe Deaf Paging System Interface Panel provides early warning of fire to people who are deaf and hard of hearing, allowing them to react promptly and appropriately to ascertain their own safety. This system can be installed in any building where a commercial type BS 5839-1 fire warning system is installed. Designed to comply with all relevant parts of BS 5839-1 2013, this interface panel links directly to the building's existing fire alarm main panel via a volt-free relay. The integral radio transmitter provides a range of up to 1000 metres in open air, with excellent coverage throughout all types of building construction. By linking the Fire Safe Interface Panel into a fire warning system, the deaf and hard of hearing will be alerted on their personal pager or SignWave portable receiver whenever the building's main fire alarm is activated. The Silent Alert Fire Safe Deaf Paging System Interface Panel uses multi-alerting technology, meaning that Fire Safe users will be able to receive alerts from a multitude of different receivers. Any monitor in the Silent Alert range is compatible, including doorbell, telephone, baby alarm and door entry systems. That makes this system an unbeatable option for companies who are aiming to meet their responsibilities under the DDA and current Fire Safety Legislation. One of the main advantages that this system holds over the competition is it's ability to provide such a large scope of coverage with a low cost and easy installation. The equipment can be fitted and maintained by the customer's own fire alarm maintenance company, without the need for expensive and long-term maintenance contracts.